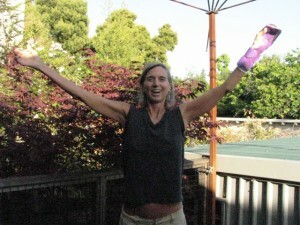 On June 6, I had surgery to repair several ruptured extensor tendons in my left hand. Two days later I was enjoying an hour-long urban Wellness Walk in the Berkeley hills. I tell you this not to brag (OK, there’s a little bragging in the mix), but more importantly to remind you that it’s possible to maintain health-supporting practices regardless of your circumstance. One of the best things you can do for yourself in this life is to develop an exercise routine and then stick to it — no matter what. If you’ve got relatives visiting for the week don’t let that be an excuse to slack off. Heck, invite them to join you. If you’ve got a garden variety cold, workout anyway—just make it shorter and less intense than usual (getting your circulation going will support your body to heal faster). And if life intervenes in such a big way that you simply can’t do what you normally do, improvise! Two years ago I had surgery on my feet. 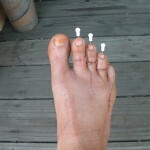 For 5 weeks I had pins embedded in — and protruding from — the tips of my toes. During that time I could neither swim nor walk more than a block. So I did the only logical thing: I took up hula-hooping! What can you do, today, to better adapt to a challenge in your life?